Congratulations on your admission to UC Davis! Now that you’ve been admitted, learn how you can stay on track between now and fall. At MyAdmissions, you can register for campus housing, complete required admission and pre-enrollment tasks, and explore the UC Davis campus. You will need to set up an account with MyAdmissions using your nine-digit UC Davis Student ID number, which can be found on your admission letter. You are expected to complete all courses listed on your application with strong grades, as outlined in the conditions of admission that every student receives on their MyAdmissions page. However, we understand that there are many situations that can impact your ability to meet these expectations, and we are willing to work with you. Use MyAdmissions to notify us immediately of any changes to your schedule or any classes not passed (a grade less than C) and we will do our best to work with you. 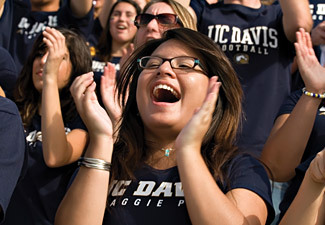 Admitted students may request a change of major after their first quarter at UC Davis. Major changes are granted at the discretion of academic departments and colleges, and typically require that you complete program-specific requirements before entering the major. You must submit all official transcripts/academic records by July 1, and official examination scores by July 15—official document must arrive in our office sealed by the issuing agency. If you are completing courses over the summer, arrange for an additional official transcript showing your final summer grades to be sent to Undergraduate Admissions by September 1. Once you have completed high school, please have your high school registrar submit your official final transcript(s) listing your date of graduation. You must also submit your official ACT plus Writing or SAT Reasoning test scores and official final transcripts from any colleges attended. Please submit official scores for any optional exams as well, such as SAT Subject, AP or IB exams.